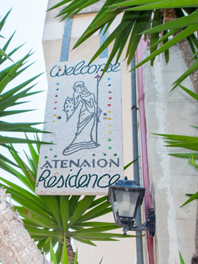 The "Atenaion" Residence is located in Otranto in Via Memorie, # 33-34. This residence represents the essence of a city rich in culture and history and that is open to and prepared for tourism. Its 27 kilometers of virgin beach and gentle limpid waters are the proof. Greeks, Romans, Normans, Austrians, Spaniards, Turks, etc., have all left their marks, but even before them were other civilizations, to which the rupestrian settlements attest. The Residence was built upon a medieval construction and one of the aforementioned primitive habitations; the modern structure blends gracefully with these testaments of the past. 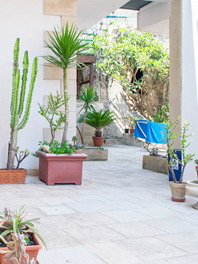 The one bedroom apartments face the standard "CORTE" or central court furnished with lawn chairs and Lecce-stone flower pots filled with exotic and Mediterranean plants. The exterior; however, only serves to increase visitor's fascination with its piney woods only 50 meters away that partially hide the Minerva Hill, sadly noted as the spot where the 800 martyrs died at the hands of the Turks in 1480 and at the top of which now stands the church erected in their honor. The silence and tranquility, coolness, fresh air, and tangible convenience of the location were the motivation behind the construction of Atenaion; of course, respecting its age old use as a habitat, reinforced by the presence of a small stream at the foot of the piney woods and the near proximity of the port, only 350 meters away. To all of this it is necessary to add the efficiency and perfect functionality of the residential complex. 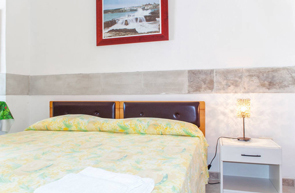 Indeed, the apartments, capable of holding 2-6 beds are designed with an eye to art and aesthetics, with a Lecce-stone façade and finished with materials of the finest quality. All plumbing and heating equipment along with emergency systems respect legal norms. Furthermore, an internal telephone system allows all guests to communicate directly with the management for any eventual needs. 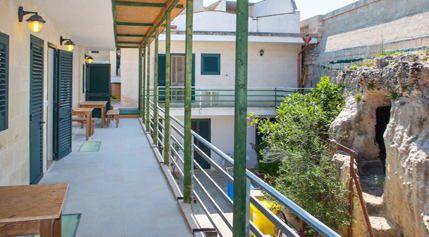 Each apartment includes use of roughly 15 square meters of courtyard space, divided by Lecce-stone flower pots.